RED SQUARE-RARE AND LOST 70S RECORDINGS. Far too often, innovative music falls to find the audience it deserves. Instead, it’s enjoyed by a small, discerning and appreciative audience. These musical connoisseurs recognise the importance of music that could, and should, influence another generation of musicians. Sadly, all too often this doesn’t happen. To rub salt into the wound, musical pioneers have to watch as bland, anodyne generic music sells by the millions. Sadly, that has been the case since the birth of modern music. This was the case in sixties, when Motown’s bland brand of poppy soul sold by the million. Hits rolled off the assembly line, as Motown became the acceptable sound of soul. Ironically, far better music, including soul failed to find an audience. For many artists, it was a frustrating time. Alas, the seventies were no different. By 1974, many Krautrock, Berlin School and progressive rock bands released albums that failed to find the audience they deserved. Amon Düül II, Brainticket Can, Cluster, Embryo, Neu! and Xhol Caravan all released albums that disappeared with trace. Meanwhile in Philly, another generic brand of soul was selling by the million. Again, hits rolled off the assembly line. The process started with teams songwriters providing songs for producers. They allotted them to the various groups they worked with. When the bands went into the studio, the same session musicians and backing vocalists accompanied each band. Along with the producer, they crafted the Philly Soul sound. Its homogenous sound proved to be one of the musical success stories of the early seventies. By 1974 Philly Soul was selling by the millions. Meanwhile, musical pioneers on both sides of the Atlantic were struggling to get their music heard. This included avant- rockers Red Square, who had been formed in 1974, in Southend-On-Sea, Essex. Red Square were founded by guitarist Ian Staples; drummer Roger Telford; and saxophonist Jon Seagroatt, who also played clarinet. The three men were experienced musicians, whose different backgrounds proved to be a potent combination. Before forming Red Square, guitarist Ian Staples had been playing with Ginger Johnson and His African Messengers. They had played at London’s famous Middle Earth club. There, Ian Staples had been fortunate to shared the stage with Pink Floyd and Marc Bolan. Having witnessed some of the biggest names in British music at close quarters. Ian began to experiment with multi-tracking, as he combined disparate musical genres. Elements of psychedelia, noise and avant-garde were combined by Ian, in Southend-On-Sea. That’s where he met Jon Seagroatt. This was around 1972, and way before the Red Square story began to unfold. Back then, Jon Seagroatt was playing bass-clarinet and saxophone. His musical tastes had changed over the years, and are best described as eclectic. He was listening to everything from Albert Ayler and Evan Parker to John Coltrane and Weather Report, plus Can, Faust, Soft Machine and The Art Ensemble Of Chicago. This melting pot of influences would later influence Red Square. Before that, Ian and Jon began to experiment. Their approach to music was very different to many other musicians. To make music, they combined everything from traditional instruments, like a violin, guitar and percussion to vocals and even toys that were used as part of the music making process. So was extensive multi-tracking. Sometimes, Ian and Jon used instruments that they had no idea to how to play. This became part of their approach to music. They were following in the footsteps of Karlheinz Stockhausen, Can and Faust. Already, the pair were in good company. Eventually, though, Ian and Jon decided they wanted to collaborate with another musician, and Red Square was born in 1974. Joining Ian Staples and Jon Seagroatt in the new band, was free jazz drummer Roger Telford. He was the final piece of this musical jigsaw. This new band they called Red Square, after the aarly Soviets Constructivists. With a name, and a sense of purpose, Red Square could set about honing their unique sound. It can be heard on a new compilation Rare and Lost 70s Recordings, which was recently released by Mental Experience, an imprint of Guerssen Records. As Red Square began practising and honing their sound, it quickly became apparent that here was a group that were determined to make innovative music. Red Square were leaders, not followers. They weren’t content to follow in the footsteps of others. Instead, they were determined to make music that would influence other musicians. The music Red Square made, was an innovative fusion of disparate musical genres. To do that, Red Square fused avant-rock with free-improv and jazz. There’s even a nod towards avant-jazz, noise and psychedelic rock. One of the most important component parts of Red Square’s music was Ian Staples’ searing, scorching atonal guitar riffs. They’re best described as raw power, as he seems to be channel the ghost of Jimi Hendrix, and combines this with elements of Captain Beefheart and avant-garde guitarist Derek Bailey. He was one of the leading light in the British improv scene by 1974, and proved an inspiration for Ian and the rest of Red Square. These disparate influences created a guitar sound that although rocky and atonal, sometimes headed in the direction of lysergic. However, Ian’s guitar playing was more avant-rock than heavy metal. Providing the backdrop for Ian’s guitar were Roger Telford and Jon Seagroatt. Just like Ian, they drew inspiration from one of the great musical visionaries of the twentieth century, Karlheinz Stockhausen. Not only did he pioneer electronic music, but eschewed traditional forms of music. Red Square became the latest disciple of Karlheinz Stockhausen. Their atonal soundscapes were compelling fusion of musical genres and influences. Very few groups would’ve thought of combining elements of avant-rock, free-improv and jazz with avant-jazz, noise and psychedelic rock. To that, they added the influence of Jimi Hendrix, Captain Beefheart, Derek Bailiey and Karlheinz Stockhausen. The result was the unmistakable and unique sound of Red Square, which bridged the gap between music’s past and future. The earliest purveyors of free-noise were AMM and the Nihilist Spasm Band, who were formed in the mid-sixties. AMM were based in Britain; while Nihilist Spasm Band were based in Ontario, Canada. Both bands however, were making free-noise, where practitioners eschewed traditional instruments for handmade or alternative instruments, including kazoos. If they used traditional instruments, they were modified, and transformed into something very different. By 1967, German musician Peter Brotzmann had joined the free-noise revolution, but by 1974 had embraced improv. By then, Red Square had picked the baton up, and were running with it. 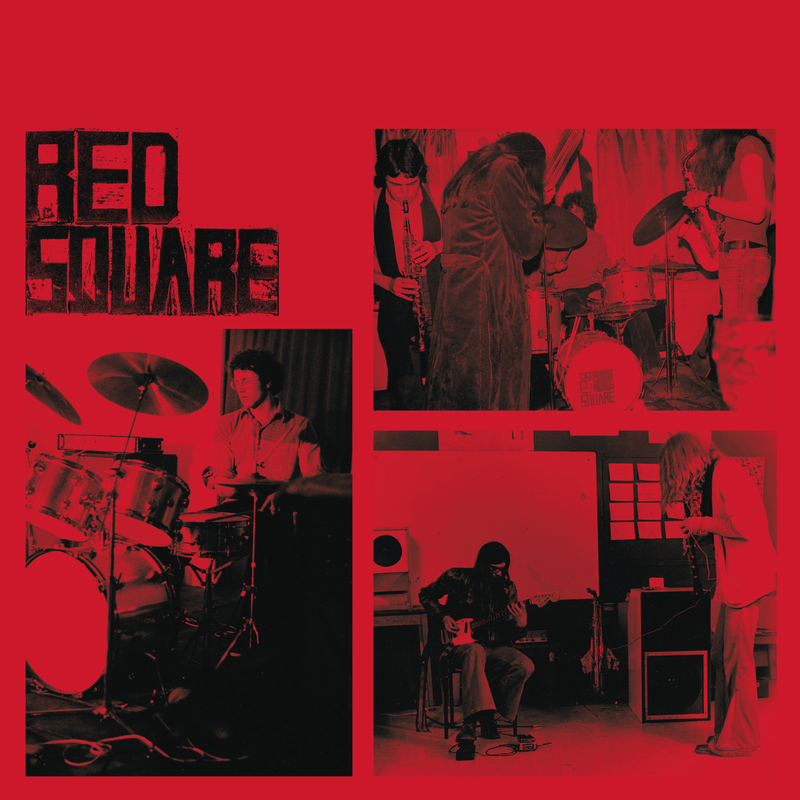 Between 1974 and 1978, avant-rockers Red Square became known as musical pioneers, who were determined to push musical boundaries to their very limits. Their genre-melting music was a captivating aural assault on the senses that demanded the listener’s attention. Red Square’s music was loud, and they were proud of it. If demanded the listener’s attention, and once they had it, didn’t let go. That was the case every time Red Square played live. They shared the bill with everyone from David Toop to Lox Coxhill and National Health. However, one of the biggest names on the scene were Henry Cow, who were signed to Virgin between 1973 and 1975. However, record companies shied away from Red Square. There were several reasons for this. Some record companies thought Red Square’s music was too extreme and wasn’t commercial. The record company bean counters were worried that Red Square’s music wouldn’t appeal to the majority of record buyers. However, Virgin had taken a chance on Henry Cow in 1973, and they released four albums for Richard Branson’s label. Maybe, there was another reason record companies were reluctant to sign Red Square. Some groups are regarded within the music industry as being difficult or having an “attitude.” In Red Square’s case, they’re remembered by some as a group who had an attitude. This in an ideal world, shouldn’t have put record companies off. However, it did. So did Red Square’s political beliefs and activities. Red Square’s only releases were two self-released cassettes. The first Paramusic, was released in 1975 by Red Square. Copies were sold locally, or after Red Square’s gigs. Then in 1976, Red Square released another cassette, Circuitry. Only a small quantity of the cassettes were released, and nowadays, are incredibly rare. This is why new compilation Rare and Lost 70s Recordings is such a welcome reissue. It takes the listener back to Red Square’s glory days. Sadly, they ended in 1978. By then, Neil Young had still to write Hey Hey, My My (Into the Black), which contained the immortal words “better to burn out, than fade away.” Red Square certainly weren’t going to fade away. Instead, they imploded in 1978, and the Red Square story seemed over. It would be thirty years before Red Square decided to reform in 2008. Not only did they take to the stage again, but they returned to the recording studio. By then, Red Square had influence several generations of musicians. The first generation of musicians influenced by Red Square, included free-improv jazz pioneers Borbetomagu. They were formed in the mid-seventies, when Red Square were in their prime. By 1978, when Fushitsusha an experimental rock band who were formed in Tokyo the Red Square story was over. Still they continued to influence bands far and wide. In the early eighties, the Sonic Youth story was about to begin. Two band who influenced them, were Red Square and The Blue Humans. They had been around since the late-seventies, and had been inspired by Red Square. However, Red Square’s music continued to influence new groups; including The Dead C, who were formed in Dunedin, New Zealand in 1986. Red Square’s music had influenced groups on four continents. For a band who hadn’t even released an album, this was incredible. As the decades passed, still Red Square continued to inspire and influence new artists. Swedish noise pioneer Mattias Gustafsson’s various projects have obviously been influenced by the late, lamented Red Square. Nearly thirty years since Red Square had imploded, their music was continuing to influence another generation of artists. Most of these artists were too young to remember Red Square. So when Red Square decided to reform, musicians and record buyers got the opportunity to rediscover Red Square. Red Square reformed in 2008, and soon were playing live. By December 2008, Red Square were ready to release their long-awaited and much-anticipated debut album Thirty Three. It featured music that Red Square made between 1974 and 1978. For fans of a certain age, Thirty Three was a walk down memory lane with a truly pioneering band. What’s more, Thirty Three featured ambitious, inventive and innovative genre-melting music. This proved to the just the first of several releases from Red Square. Their next release came in 2009, when Red Square released Shuttle Bag. It featured four tracks where avant-garde, free-improv and free jazz melt into one. Then on 22nd November 2010, Red Square released a live album UnReason: Red Square Live At The Vortex. the album had been recorded at the Klub Kakofanney, in Oxford in 2009. By then, Red Square were incorporating electronics into their music as they played at clubs and festivals across Britain. The electronics came courtesy of Jon Seagroatt. Red Square music was continuing to evolve. This continued when Red Square released a new studio album, Bird Haus on 31st January 2012. It was as if Red Square were making up for lost time. Just like previous releases, Bird Haus was well received by critics, and hailed as an innovative album. However, since the release of Bird Haus, Red Square haven’t released another album. Still though, Red Square continue to play live. That is despite the three members of Red Square approaching veteran status. Ian Staples, Roger Telford and Jon Seagroatt it seems have lost none of their appetite for music. The only blot on the horizon was the lack of a new album. However, Red Square went one better than a new album when a new compilation Rare and Lost 70s Recordings, was recently released by Mental Experience, an imprint of Guerssen Records. It features Red Square at their very best. Rare and Lost 70s Recordings sees the listener go back in time with Red Square, to 1976 and 1978. That’s when we hear the two very different sides of Red Square on this seven track album. The first four tracks on Rare and Lost 70s Recordings were recorded during what’s thought to be the last ever Red Square rehearsal in 1978. Its entitled Nakamichi Studio Live Session, 1978. This previously unreleased set features Nakamichi #3, Nakamichi #4, Nakamichi #5 and Nakamichi #6. These tracks were recorded using just a Nakamichi field recorder, and are described by Jon Seagroatt as: “a guitar-fuelled maelstrom.” He’s not wrong. Thunderous, drums and a scorching, avant-rock guitar play starring roles on Nakamichi #4. Then on Nakamichi #5 the three members of Red Square jam, improvising and fusing musical genres and influences. As they do, they create a dramatic and mesmeric epic which features Red Square at their inventive best. They’re constantly pushing musical boundaries, as they reach new heights of inventiveness. Nakamichi #6 is the last of the tracks recorded in the studio. Gradually the arrangement quickens, and fills out. Soon, elements of free jazz, fusion, psychedelia and rock are combining with avant-garde and free-improv. Guitarist Ian Staples plays a starring role, while Roger Telford pounds and punishes his drums. Meanwhile, saxophonist Jon Seagroatt unleashes a wailing, howling Ayler-esque saxophone solo. It’s part of a track that veers between melodic and moody to cinematic, lysergic, rocky and Henrix-esque. It leaves the listener wanting more. Fortunately, there’s still the trio of live tracks. Having enjoyed hearing Red Square at their heaviest on the four live tracks, Red Square role back the years to 1976, when they were about to open for Henry Cow. Despite the being forty years old, and recorded on relatively modest equipment, the sound quality is peerless. It’s been remastered by Jon Seagroatt, and features what’s regarded as a tantalising taste of one Red Square’s finest live performances. Circuitry #2 allows Roger Telford free jazz drummer to showcase his considerable skills. Soon, though, the rest of Red Square are fusing avant-jazz, free-improv with another searing, scorching avant-rock guitar solo from Ian Staples. Later, an impressive array of percussion proves to be the icing on what’s a delicious musical cake. The percussion reappears on Circuitry #3, and is joined by Red Square’s modified and handmade instruments. They play an important part in this fusion of avant-garde and free-improv. Later, though a braying saxophone joins washes of feedback and a growling guitar. By then, elements of free jazz, industrial, psychedelia and rock shine through, as Red Square continue to push musical boundaries. Soon though, Red Square’s live performance and Rare and Lost 70s Recordings is almost over. Red Square’s swan-song on Rare and Lost 70s Recordings, was Circuitry #4. Ian delivers an avant-rock guitar masterclass, as he drives the rest of the band on. Soon, they’re soon reaching new heights as they combine avant-jazz, free-improv and free jazz. At the heart of a truly innovative, genre-melting track is Ian’s fuzzy guitar and Jon’s wailing saxophone. They add to this dramatic musical vortex, which is guaranteed to leave the listener spellbound, after it stops them in their tracks. This proves the perfect way to close Rare and Lost 70s Recordings. It’s the perfect reminder of a truly innovative band, Red Square. They were formed in 1974, and imploded in 1978. By then, Red Square hadn’t even released an album. Their modest discography consisted of just two self-released cassettes. However, since Red Square reformed in 2008, they’ve been making up for lost time. Rare and Lost 70s Recordings is just the latest release from the avant-rock pioneers, who have influenced several generation of musicians. Even today, bands cite Red Square as one of the bands who influenced them. Rare and Lost 70s Recordings will allow many of these bands to hear Red Square at the peak of their powers in 1976 and 1978. During that period, Red Square were one of leading lights of the avant-rock and free-improv scenes. Red Square created groundbreaking music that could’ve, and should’ve, reached a much wider audience. Sadly, record companies were reluctant to sign Red Square. The band were regarded as having an “attitude.”while their music was deemed to extreme to be commercial. It seemed none of the British record companies were willing to take a chance on Red Square during the seventies. As a result, Red Square’s music failed to find the audience it deserves. Instead, it was enjoyed by a small, discerning and appreciative audience. These musical connoisseurs recognised the importance of music that went on to influence several generation of musicians. Nowadays, Red Square are belatedly receiving the recognition, plaudits and critical acclaim their music deserves. Hopefully, the recent release of Rare and Lost 70s Recordings will result in Red Square’s music belatedly reaching the wider audience that it so richly deserves. Thanks for that excellent review. Thanks for your kind words. I thoroughly enjoyed reviewing the album. It’s one of my favourite releases of the year. Thanks again Derek, we are thinking of releasing a run of just 50 of our favourite recent recordings ,I’ll send you a copy if we do. Regards Ian. Good to here from you. If you do decide to release an album of your favourite recent recordings, I’d be delighted to review it. Just contact me here, and I’ll send you details.